Castleford Tigers players have a laugh with head coach Daryl Powell during the club's media day. Daryl Powell is pleased with the way Castleford Tigers’ pre-season training is going and is now ready to see the progress on the field when the team travels to Wakefield Trinity on Sunday for their second warm-up game. 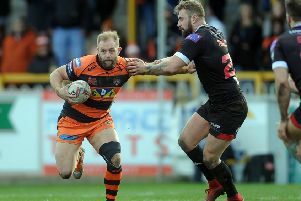 The Tigers head coach said the players were itching to play now after some tough training and want to see some fruits of their labours out on the pitch. He told the Express: “Everything’s going well. But we are well into pre-season now and you get to the point where coaches and players just want to have a game. “We’re getting close to the season now and everybody’s looking forward to putting their hands up. “The boys have trained superbly this pre-season. It’s been hard work for them and we will hopefully begin to see the results of this. “We’ve had one game so far and this is another step we’re looking forward to.